Monday afternoon in New York, President Trump fulfilled another one of his promises to the American people. In a ceremony with South Korean President Moon Jae-in, President Trump signed a revised U.S.-Korea free trade agreement (KORUS), which has significant wins for American workers and businesses. This is just the latest in President Trump’s ongoing effort to deliver more secure, free, fair, and reciprocal trade deals for the American people. 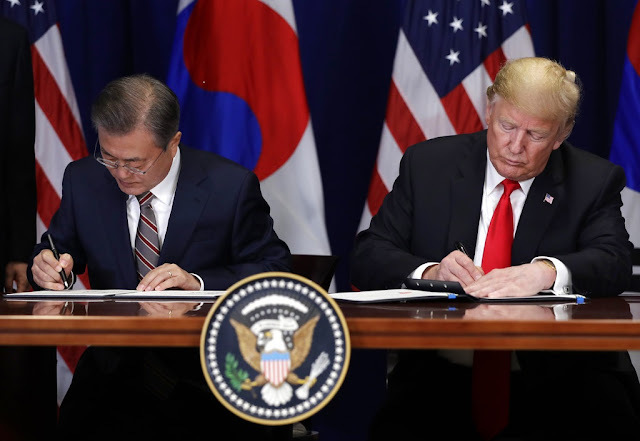 IMPROVING BAD TRADE DEALS: President Trump has fulfilled his promise to fight for American workers and businesses in an amended trade deal with South Korea. CUTTING RED TAPE ON EXPORTS AND HOLDING TRADE PARTNERS ACCOUNTABLE: The Trump Administration’s negotiations will eliminate burdensome regulations that have impeded United States exports and ensure that trade partners follow through on implementation. 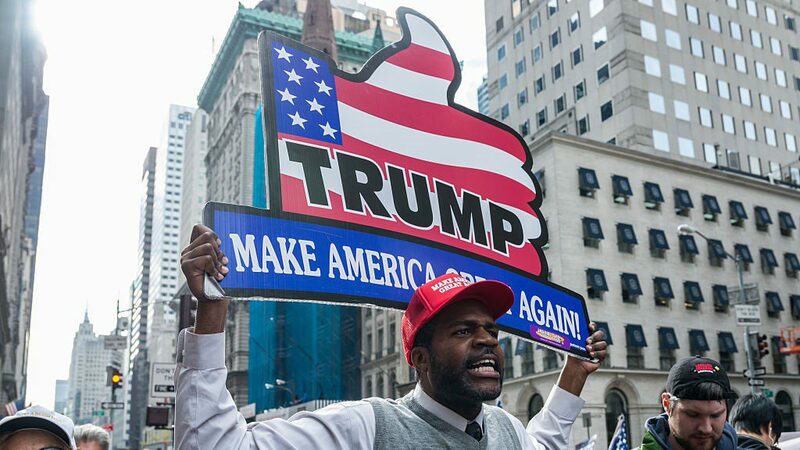 The growing positive attitude of black voters towards President Trump is the wildcard in the coming midterm elections. It is real and it is expanding. Polls are showing anywhere from 20 percent to 36 percent of blacks approve of President Trump. The Democrats even may have lost 11 percent of black women. The cracks in the black Democrat bloc voting are one of the most consequential results of Barack Obama’s presidency and the phenomenal effectiveness of President Trump’s pro-business policies. This could be a historic turning point. Trump’s economic policies have improved the lives of black Americans, just as he promised they would during the election. Unlike Obama’s media hype, Trump’s progress is as real and as solid as his buildings. Black unemployment continues to fall. Good manufacturing jobs are coming back. Paychecks are rising, too. The roots of this political watershed in the black community are more complex than job figures and will last beyond Trump’s tenure. I have been listening for hours to ordinary black Americans on the #Walkaway movement’s YouTube channel. This is a movement of former Democrats explaining why they are leaving their party. While each face, voice, and story is unique and fascinating, there are some striking recurring themes. President Obama raised the hopes of black Americans to the highest they’ve been since Martin Luther King. The entire country expected he would devote himself to getting blacks better schools, more jobs, higher wages, and safer neighborhoods. Instead, Obama ignored those bread-and-butter needs. His signature initiative was to send Eric Holder to stoke up publicity and fear in the wake of the Trayvon Martin and Michael Brown shootings. The #Walkaway videos are remarkably consistent on that score. Obama got them paying attention to party politics for the first time. Next came the emotional roller coaster, as joy turned to disappointment. Obama’s identity politics agenda, now amplified by progressive Democrats, was a cynical ploy and it has become is a total turn off to those now paying attention. These black voters hate illegal immigration. Obama marked the end of their romance with the Democrat Party, not a new beginning. Few of these ex-Democrats voted for Trump, but they were willing to give Trump a chance after the election. They find Trump Derangement Syndrome ludicrous. In fact, they love what he is doing. They appreciate the jobs he is creating, and they share his patriotism. A last, and very interesting theme, is after Obama got them engaged, most of these black Democrats started doing research on the internet. They were riveted learning the history of the Democratic Party. They care deeply and viscerally about slavery. What a shock to discover they had been lied to about it all their lives. President Lincoln was not a Democrat, as they’d been led to think in school. It was not Republicans who were the party of racism, but Democrats. They learned for the first time that Democrats were slave owners. Over and over, they share their surprise at learning the Democrats are the party of Jim Crow and the Ku Klux Klan. Democrats are the party that destroyed the black family. Bill Clinton set off the explosion of black incarceration. They are done permanently as Democrats. “As soon as he got in office, this dude started going sideways . . . this isn’t what we voted for,” the Millennial says. Obama focused on getting money and votes from greens, gays, feminists, and illegals, and used race-baiting to keep the black vote. They noticed nothing got better. These are people who did not have the luxury to make excuses for Obama. Many in the black community are enduring real suffering—not the snowflake variety. They were looking for results, not left-wing virtue signaling. Obama broke the spell. Here was the ultimate Democrat who had a shot to come through and improve black lives, and he fired blanks. "All [Democrats] want to do is monetize white guilt . . . it’s not really productive, man, because we never address the core issues . . . . [Democrat] policies do not work . . . enough is enough. It is time to break the cycle. Me, I made a decision, man, I can no longer support the Democrat Party. Because they are not the party for black people, they’re not even the party of America. They are such a far-Left socialist party . . . I don’t know who they’re working for—it ain’t us. In every state they run . . . opportunities diminish . . . their policies are failed. . . . I can’t do it anymore. I’m conservative." Hillary Clinton tried to follow in Obama’s footsteps with identity politics. But many black men feel targeted by feminism. Others are appalled by the Democratic Party’s promotion of abortion, which disproportionately targets black communities. Black men and women are furious that illegal aliens seem to receive better treatment from Democrats than American citizens. Intersectionality is failing to unite them with the other privileged grievance groups. These voters realize their interests are not identical or even similar to leftist politics. Hillary personally was a turn-off and her corruption was appalling. A former Bernie Sanders supporter expresses his disgust, which extended from Clinton to all progressives, eventually including Sanders himself. “The thing that completely opened my eyes like someone threw cold water on you in the middle of the night . . . was the DNC rigging the election,” he says. The progressive Democratic Party has no positive message for blacks. And then Donald Trump happened. Trump was not a turn off to them. He is familiar. Trump was known and liked by many blacks because of “The Apprentice.” They are fine with his braggadocio and outsized personality. They admire his success as a businessman. Some know his reputation as a friend of blacks. Some were willing to give him a hearing and a chance. Even those who did not vote for Trump are open about how much they love him now. President Trump is delivering, big time, on jobs, on crime, on actually improving their daily lives. They are listening to Republicans, they’re meeting them at work. They like them and realize they have shared values. They are finding out for themselves that Republicans are not racist. These black voters have Republican values on abortion, marriage, hard work, creating opportunities for people to make something of themselves, and loving America. It might take a few seconds for the enormity of Page’s statements to sink in. 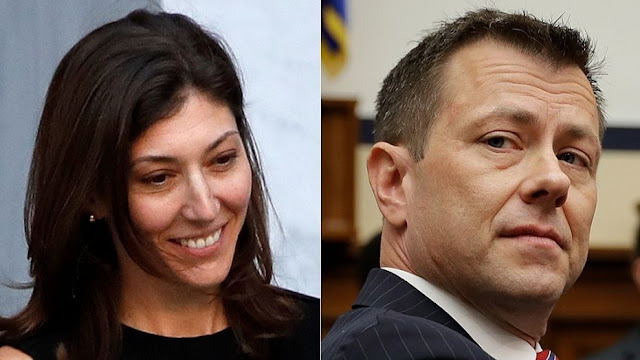 After all, she isn’t just any FBI lawyer. She was a lead on the Russia case when it started in summer 2016, and she helped it transition to Mueller through summer 2017. Page’s comments also mean FBI and Justice officials likely leaked a barrage of media stories just before and after Mueller’s appointment that made the evidence of collusion look far stronger than the frontline investigators knew it to be. Earlier this year I wrote a series of posts contra the dross of April Doss. The “dross” was found in the Weekly Standard cover story by Doss. 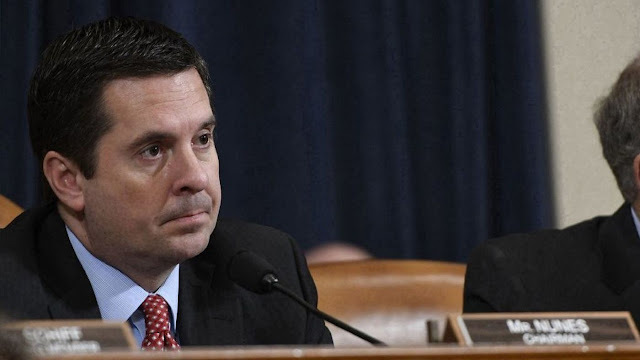 The cover story disparaged House Intelligence Committee Chairman Devin Nunes and asserted that he is retailing a “conspiracy theory” involving the Obama administration’s misuse of FISA on Carter Page to investigate the Trump presidential campaign. Doss purported to lay down the truth about Nunes and FISA. The truth is that Doss’s cover story was a disgrace. The FISA warrant applications on Carter Page open a window onto the biggest scandal in American political history. I have embedded them here previously and have embedded them again below. They are the ocular proof of the scandal. The invaluable Andrew McCarthy has now cracked open the window a little wider in two columns with one theme: FISA Docs Show: Long Before Mueller, Trump-Russia Was an Investigation Without a Crime. The first column (posted yesterday afternoon) is “Reading the FISA redactions.” The second is “In the Russia Probe, It’s ‘Qui S’excuse S’accuse’” (posted this morning — the French expression is to the effect that “he who excuses himself accuses himself”). Andy says he has read the FISA applications so you don’t have to. He has performed a great public service in these columns. Even so, I say you have to review the FISA applications with your own eyes. It was the burden of the government to establish probable cause that Page was engaging in espionage, terrorism, or sabotage by or on behalf of a foreign power that involved a violation of a criminal statute. 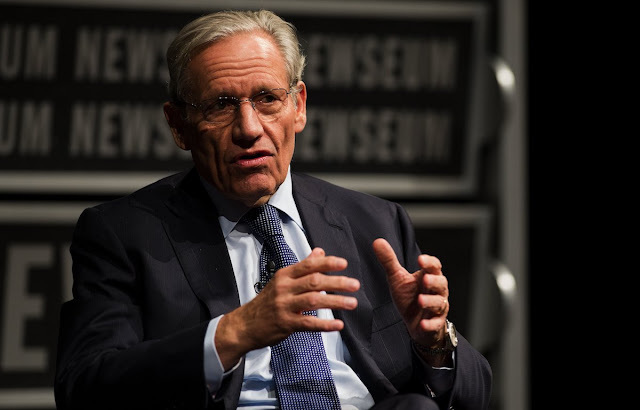 Quotable quote: “[L]et’s dispense with the tired claim that the Obama administration did not really spy on Trump and his campaign. “I plead guilty," Manafort, 69, told U.S. District Judge Amy Berman in Washington. Prosecutor Andrew Weissmann told the judge that Manafort's deal includes a cooperation agreement with prosecutors, who are investigating whether any Trump associates played a role in Russia's meddling in the 2016 election. That could include interviews with prosecutors and testifying in court. A defense attorney for Manafort told Fox News the deal includes "full cooperation." But the president's team downplayed the significance of Manafort's plea. “Once again an investigation has concluded with a plea having nothing to do with President Trump or the Trump campaign," Trump lawyer Rudy Giuliani said in a statement to Fox News. "The reason: the president did nothing wrong." White House press secretary Sarah Sanders said Friday that Manafort's decision is "totally unrelated" to the president. “I feel very badly for Paul Manafort,” Trump told reporters after the August verdict, adding that it had "nothing to do with Russian collusion." The president has called Mueller's probe a "witch hunt." 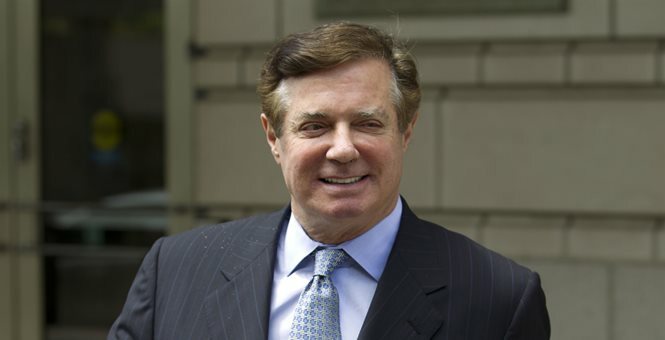 Downing, Manafort's attorney, suggested after the guilty verdict in August that Manafort was open to striking a deal before the second trial. Fox News' Catherine Herridge, John Roberts and NuNu Japaridze contributed to this report.